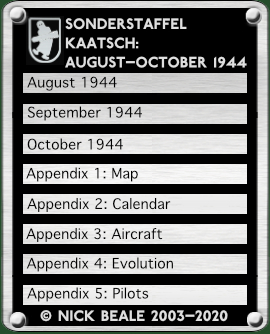 Sonderstaffel Kaatsch was an emergency tactical reconnaissance unit, scraped together in a matter of days from the remnants of two regular tactical reconnaissance Staffeln and an auxiliary fighter Gruppe. This is a further revised and expanded version of my original piece on this short-lived Luftwaffe unit, making use of new research. On 4 August, Jagdgruppe 200 had been assigned four Bf 109s but had to collect them itself from Hptm. Öls’s JG 27 rear detachment at Champfleury. Ten days later, as we have seen, JG 27 signalled that four pilots had duly arrived from JGr. 200 to fetch aircraft that had been made available by II. Jagdkorps on the 6th. The machines in question had already been handed over to JG 3 however. On the 15th, II. Jagdkorps told JG 27 that the four JGr. 200 men should instead report to II./JG 2 at "Airfield 409." This was thought by the Allies to be a satellite of Creil and indeed II./JG 2 was based at Baron, 18 km. south east of there. In the unravelling German situation their journey (130 km. by road) may not have been easy and another week passed before British Intelligence heard any more of them. On Saturday the 19th, German forces in France were in deep trouble. In Normandy, the Allied encirclement was closing around the Fifth Panzer and Seventh Armies; in Provence, in the south, the Nineteenth Army was ordered to pull back north up the valley of the River Rhône following the Allied landings on the Riviera. Luftflotte 3’s units were withdrawing toward Belgium and Germany in some haste. Nineteenth Army needed to disengage and gain the Beaune-Dole-Dijon area before the US Third Army, driving east across France, cut it off from Germany. It was vital to know where the opposing regular forces were and what threats were posed by the many active Resistance groups in the mountains flanking its route and, in particular, by the American forces (Task Force Butler and the 36th Division) moving in from the east and threatening to cut the Rhône Valley routes in the Montélimar – Livron sector. Nineteenth Army has been without any kind of fighter protection, recce and close-support forces since 19 August. Army Group urgently requests that new units be brought up, especially recce and fighter aircraft. Recce on the eastern flank of the Army most necessary; presence of fighters necessary for carrying out recce, and also for psychological reasons for the troops. (1) 2. Flieger Division is transferring on orders of OKL to OB Süd West. (2) Following will remain for the present in the area of Army Group G: 2./NAG 13, Stab JG 77, II./JG 77, Jagdgruppe 200. (3) 2. Flieger Division has task with these forces of effecting cooperation with Army Group G and/or 19 Army until roughly area Valence is reached. (4) From this area onwards, Luftlotte 3 will continue cooperation with Army Group G with forces from the Dijon area. Between Donce [?] and Valence strong saboteur activity. All the Rhône bridges between Lyon and the estuary destroyed. Crossings possible only on single ferries which are not easily enough available. Fighter-bomber activity is hampering our movements. At 13.30 hrs. (local time) on the 22nd, Jafü Süd asked after the locations of various "march groups", among them a "Kröck Group" (Maj. Hubert Kröck had commanded JGr. 200) which was headed for Dijon; at 16.00 hrs. Air Movement Control at Dijon was notified that the Bf 109 being flown in from Creil by Ltn. Bell had been re-routed to Strasbourg. Kurt Bell was 2./JGr. 200’s Staffelführer and at least two more pilots from the same Staffel, Lt. Max Moschke and Ofw. Eduard Isken, are known to have served with Sonderstaffel Kaatsch. Urgent requests were also made to Luftflotte 2 in Italy for photo-reconnaissance of roads in Provence including those from the Esterel Mountains to Cannes and Grasse and around Castellane, and coverage of the relevant area was ordered for the following day. Nevertheless, they complained again on the evening of the 23rd that there had been no reconnaissance of its eastern flank. Allies cross the Seine north and south of Paris.